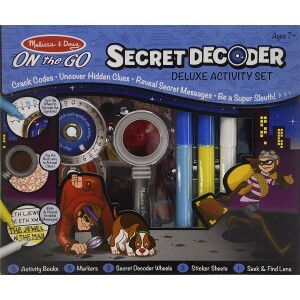 Melissa & Doug have created this activity set for the code breaker among us. They challenge you to solve the dozens of mini mysteries. With over 50 activities made up of 3 activity books, 2 sticker sheets, 2 decoder wheels, 2 colour change markers Secret Decoder, 1 invisible ink marker and a seek and find lens this will keep any budding secret agent busy for a while. The deluxe activity set comes with free delivery.